Marise Narcisse is a high ranking member of the Fanmi Lavalas political party in Haiti. She was a candidate for president in the 2016-17 presidential elections. 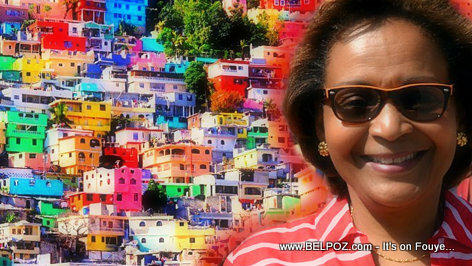 The colorful artwork you see behind her is the Jalousie slum (in Haiti a slum is called bidonville) overlooking the the city of Petionville, where the rich people live and hang out, on the side of Morne Calvaire. A project to turn Jalousie into a colorful objet d'art it is today was undertaken back in 2014 by the Martelly-Lamothe administration. Discover more about Haiti's Jalousie Slum In Living Color here. Learn more about Maryse Narcisse and Fanmi Lavalas politics here.